Rokafella founded La Roka NYC to celebrate Hip-Hop's global innovations in fashion. Fat Lace Earrings integrate the original look of "fat laces" (that is synonymous with early Bgirls and Bboys fashion) and hoop earrings for this millennium. 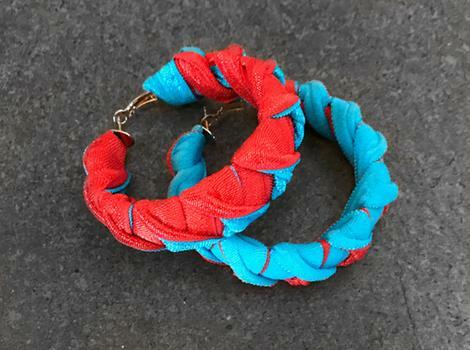 Wrapping hoops with the laces and other fabric is a way to honor the old with a new twist. Ana "Rokafella" Garcia is a New York City native who has represented women in professional hip-hop dance over the past two decades. She has been featured in pivotal rap music videos, tours, film and commercials. With her husband, veteran Bboy Kwikstep, she co-founded Full Circle Prod Inc—NYC’s exclusive non-profit Break Dance Theater Company. She directed, “All The Ladies Say," a documentary highlighting the Bgirl lifestyle with support from the Ford Foundation and performs original music based on her experiences growing up in Hip-Hop's Mecca. She is a renowned judge in international break dance competitions and teaches workshops aimed at evolving and preserving its technical aspects. In May 2017, she launched ShiRoka—a t-shirt fashion line with Shiro, a Japanese graffiti writer, to add to her earring designs. Rokafella is a multi-faceted Hip-hop artist who references street and Latino culture as her foundation. Please contact BxMA Design Shop Coordinator, Cynthia Batista, for a full product line, color options, and BxMA Membership discounts.